Each element contains only one kind of atom. The number of protons in an atom is called the atomic number. For example, all atoms with 6 protons are of the chemical element carbon, and all atoms with 92 protons are of the element uranium. The number of protons in the nucleus causes its electric charge. This fixes the number of electrons in its normal (unionized) state. The electrons in their atomic orbitals determine the atom's various chemical properties. Elements are the basic building blocks for all types of substances. When they are combined with each other, they can form molecules. 118 different chemical elements are known to modern chemistry. 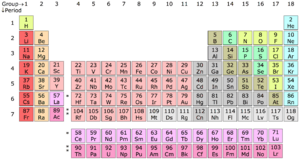 92 of these elements can be found in nature, and the others can only be made in laboratories. The human body is made up of 26 elements. 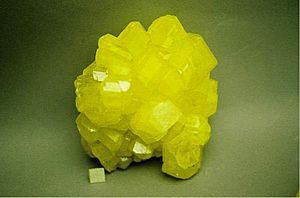 The last natural element discovered was uranium, in 1789. The first man-made element was Technetium, in 1937. Chemical elements are commonly arranged in the periodic table. Where the elements are on the table tells us about their properties relative to the other elements. Chemical elements are also given a unique chemical symbol. Chemical symbols are used all over the world. This means that, no matter which language is spoken, there is no confusion about what the symbol means. Chemical symbols of elements come from their English or Latin names. For example, carbon has the chemical symbol 'C', and sodium has chemical symbol 'Na', after the Latin natrium. Tungsten is called 'W' after its German name, wolfram. 'Au' is the symbol for gold and it comes from the Latin word for gold, aurum. Another symbol which comes from Latin is 'Ag'. This is the element silver and it comes from the Latin argentum. Lead's symbol, 'Pb', comes from the Latin plumbum and the English word plumber derives from this as pipes used to be made out of lead. 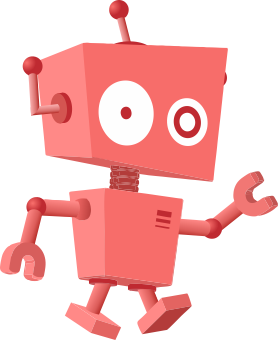 Others were named after famous people, like einsteinium, which was named after Albert Einstein. Elements can join (react) to form pure compounds (such as water, salts, oxides, and organic compounds). In many cases, these compounds have a fixed composition and their own structure and properties. 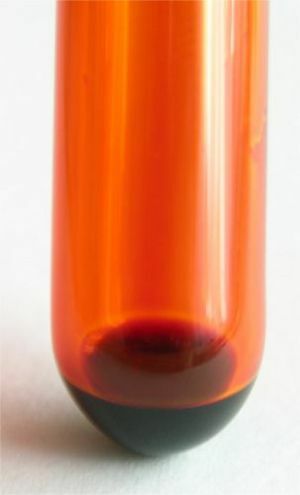 The properties of the compound may be very different from the elements it is made from. Sodium is a metal that burns when put into water and chlorine is a poisonous gas. When they react together they make sodium chloride (salt) which is harmless and edible. Some elements, particularly metal elements mix together in any proportion to form new structures. Such new structures are not compounds. They are called mixtures. Most elements in nature consist of atoms with different numbers of neutrons. An isotope is a form of an element with a certain number of neutrons. For example, carbon has two stable, naturally occurring isotopes: carbon-12 (6 neutrons) and carbon-13 (7 neutrons). Carbon-14 (8 neutrons) is a naturally occurring radioactive isotope of carbon. Of each element, except for Ununoctium, at least two isotopes are known. Elements can be classified based on physical states. At room temperature and pressure, most elements are solids, only 11 are gases and 2 are liquids. Elements can also be classified into metals and non-metals. There are many more metals than non-metals. However, a few elements have properties in between those of metals and non-metals. These elements are called semimetals (or metalloids). Chemical element Facts for Kids. Kiddle Encyclopedia.